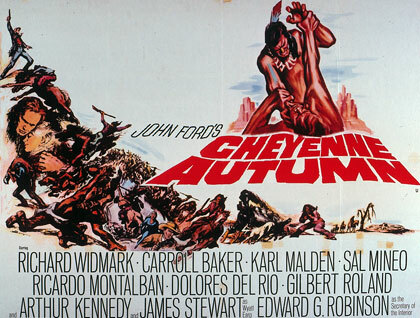 Cheyenne Autumn was the most expensive film of Ford's entire career, and, as revealed to Bogdanovich in 1966 he committed himself to it in the mistaken belief that he could in some way redress the balance of the traditional negative presentation of native Americans in westerns including his own. "People in Europe want to know about the Indians. There are two sides to every story, but I wanted to show their point of view for a change......we've cheated and robbed, killed, murdered massacred and everything else, but they kill one white man and God, out come the troops." Ford might have added that in the case of the Grattan massacre in 1854 it was not even a white man's death that caused the problem but the death of a Mormon's cow. He was also being guilty here of bracketing all Indians together, and often this in itself was the root of the problem, that the US cavalry treated the crimes or misdemeanours of individual Indians as the collective responsibility of the group. "Ford's ambitious attempt to rectify what he perceived as an imbalance in is own work is a testimony to his concern with artistic legacy and his deep seated sense of justice." (McBride, 643) However Ford's sense of justice did not extend to crediting or paying the author of his story, Howard Fast who had published it under the title The Last Frontier. The Last Frontier includes the interlude in Dodge City which sits very incongruously with the film since Ford tried to make it into a light hearted interlude, an antidote to the seriousness of the rest of the picture. Because of his dislike for Fast's left wing politics instead Ford chose to credit Mari Sandoz with the original story before it was adapted for the big screen by James R Webb, the scriptwriter of How the West was Won. Ford's biographer, Joseph McBride claims that the film was an amalgam of the two books, but I don't think that Sandoz's work figured greatly, if at all, except in as much as it gave John Ford and James Webb the idea of writing the script from the Indian's point of view as well as the US cavalry. Fast's superb book hardly needed any embellishment. Critics agree that the resulting story being told from two sides was not a success since the film's style becomes rather detached, more like a documentary, and fails to inspire the empathy and involvement which the filmgoer expects from a Western. Ford's health was fading - his eyesight was very poor and he had been diagnosed as having hardening of the arteries. This, not to mention his advancing years, meant that he was unable to stand up to the physically exacting schedule on location. Not only did this result in his performance being less than his best, but some of the shooting had to be delegated to his deputy Ray Kellogg, who was technically able to fulfil the role but who not unnaturally was unable to reproduce the artistic magic of Ford himself. In many respects the problems of Cheyenne Autumn were there in Two Rode Together - the same incongruous bedfellows of jaunty humour and serious underlying message that is undermined by a lack of subtlety. It was another step down the line away from Ford's best films. His earlier work never presented itself as the truth but gave the audience the chance to think for itself. This is why there has been so much debate about its meaning, for like all great art these films were open to widely differing interpretations, depending on the values of the individual. Cheyenne Autumn is like the tired aging teacher who, no longer having the ability to inspire interest in his students, loses sight of his mission to inspire and enable them to learn and falls back on telling them what to think. However laudable the message the result is counterproductive, since instead of creating a work for others to emotionally experience and test their values, Ford has created a personal statement of where his experience has led his values to reside, dressing it up as the work of art that it is not. As Richard Maltby points out, in Cheyenne Autumn Ford reverses his allegiance from Whites to Indians, "motifs from previous films, notably "She Wore a Yellow Ribbon" are transferred". (Maltby, 40) In doing so Ford devalues his integrity. Just like the newspaper editor in Cheyenne Autumn who cynically does a volte face by presenting the Indian as a 'Noble Savage' in the attempt to sell more papers. The history of injustice which is contained in this film is important and the story of the Northern Cheyenne is an epic journey against adversity. The notable work of art on the subject, sadly now out of print, is the book which went uncredited by Ford, to his shame. If you are interested in the subject and you can find a copy I strongly recommend that you read it rather than watching this very moderate film.